It took ages to choose my new kitchen cabinet colours (I'm not a fan of white kitchens for me...) - now I'm stuck on colour of glass for splash back - glass supplier recommends dark for a classy look but I'm worried it'll all be too dark (photo is night time so normally plenty of natural light) - what do you think? I would choose a light burgundy colour. wuff post photos of your chair ? Definitely a pattern. Quite like the glass tile idea. You could be very brave and place your favourite image, behind a clear glass splashback. Maybe some colour, which I always like, or perhaps even a monochrome image would look classy, i.e. image of your own cbd, or your city skyline or as it is your kitchen, perhaps an image of your local foodies market would look vibrant, then decorate with a couple of Alessi items on the benchtop. I agree with your glass supplier. 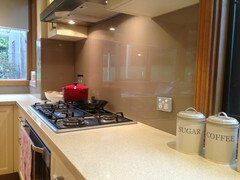 My first thought whilst looking at your kitchen photo was to go with a 'smokey quartz/grey' glass splashback. I reckon this colour would blend well with the rest of the kitchen and provide a good contrast to the wooden floors. Too much colour may take away from the beautiful cabinetry and make the overall area look too busy. Good luck clikmania. You have a beautiful kitchen. Elegant look so far but I think in all the 'slickness' it's clear your kitchen is missing just one element. Texture! Have you considered pressed tin? It adds an extra dimension, styles range from traditional (first pic, in its natural form will also bounce light around the space) or a more modern take (second pic, as you can see colours can also be varied, black is available but I think you need a contrast)... 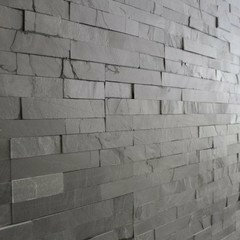 If pressed tin is not your thing still try some textured tiles like the third pic, I think you'll be pleased you added a more tactile, visually interesting surface. 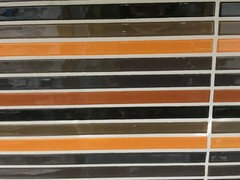 Nothing to do with colour but I recently spoke to friends who redid their kitchen and they were advised not to choose glass over tiles, as glass requires an obscene amount of cleaning to get rid of cooking marks unlike tiles which are far more forgiving and easier to clean. 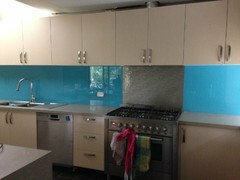 I too was desperate to have glass splashbacks in my kitchen but now I'm quite unsure and will probably go with tiles. Hope someone out there says I'm wrongly informed, as I so love glass!! Thanks for your advice, nothing like getting information from someone who knows or has a product and can comment on maintenence. I have just had my kitchen drawn up for a Bunnings Kaboodle design, not 100% sure of it yet but for now, just looking at my options, as the service is free in store, so it's wonderful to be able to look at your own design in 3D and get a real feel for how it can look finished!!! 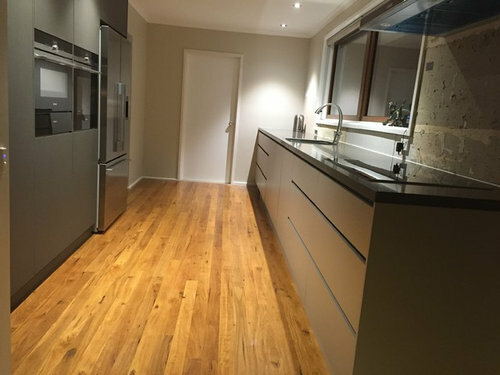 The door/draw quality seem to be quite good, as I chose the best they had in the range and I plan to go stone benchtops not laminate, so I could continue the stone for a splashback for sure. Hi, nice kitchen. If you want to keep the classy look, because all your fixtures are chrome, I'd consider a light silver metallic. Good luck! 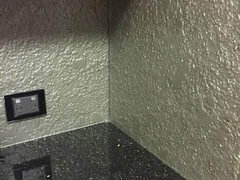 Recently had your same decision regarding splash back for our new kitchen. We worked with s great interior designer who convinced us to take a risk. Wow Factor... stick with aluminium splashbach. versatile clean lines and easy maintenance. 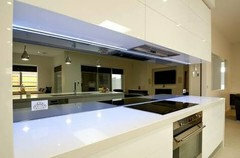 That's a nice modern kitchen there, how about a black mirrored splash back as an idea? Hi Clikmania, smoked or grey glass, good luck, please show us the photos when you have chosen your art piece etc. Enjoy! 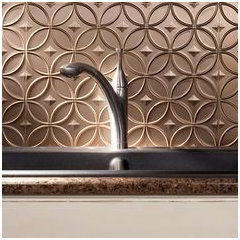 Hi, I would go a bronzed mirrored splashback. Looks amazing very lux and classy. Good luck. 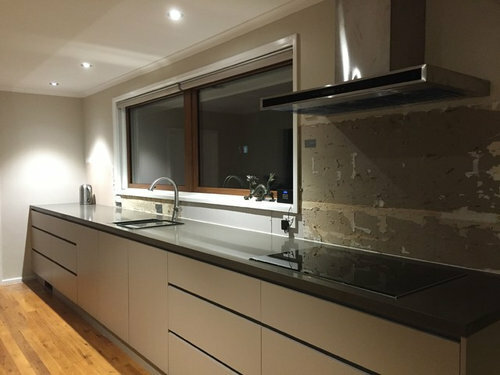 The visual offered by Edwards Renovations Pty Ltd looks pretty close to the 'smokey quartz/grey' glass splashback I had in mind, with the added mirror effect. This would really open up the space and give you the light aspect you required. Keep in mind that texture can always be introduced in other ways. For e.g. through plants, such as Leather Leaf Ferns, artwork - which would look good placed on the wall to the right of the door, as shown in photo one and through the positioning of some kitchen appliances/aids, kept on the kitchen bench for display/function purposes. A couple of subtle pieces may be all you need to create the texture you are wanting. I too really like the visual by Edwards Renovations Pty Ltd and quite like the added mirror effect - the glass supplier warned me against mirror but maybe I need to rethink! Barbara, Glass doesn't have to be a cleaning nightmare at all! We went for slumped glass (it is smooth to touch,the texture is on the back) and cleaning is not an issue,you can seriously wipe it with a damp cloth and it doesn't even streak! And there is no grout! It's a cleaning miracle! We have six kids so trust me,I know about cleaning! We now have a huge slumped glass splash back in the laundry too and are about to renovate two bathrooms and definitely using as much as I can in both-seriously considering it in the shower! Best decision EVER and you can have it it any color,my kitchen pics are above and I went for a purple pearl finish in my laundry and it looks amazing,hope this helps you with your choice! Thank you for the info, I actually love slumped glass and planned on having it on a few overhead cupboards as a feature so that I still had glass but not the sort that you could see through or was hard to keep clean if it was clear. 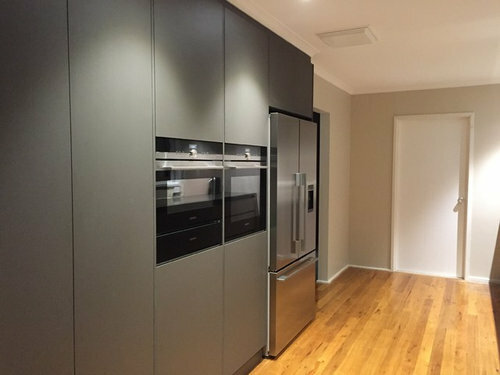 I have just completed a Bunnings kitchen quote and they have slimline overhead cupboards with a sort of green, slightly opaque glass, don't like it at all but had thought of changing it to slumped glass at my cost obviously. Appreciate the help and perhaps I can have my glass splashback afterall!!! Glass splashback a are definitely NOT high maintenance !! Quite the opposite, always look clean and smart with a simple wipe over. Glass all the way, you'll love it !! Go with something light, the dark will be, well, dark ! clikmania, I remember your cabinet colour choice dilemma. What is the name of the colour you ended up going with. It looks great! Barbara I have had a glass splash back for 6 years and would NEVER EVER GO BACK TO TILES! I hate gleaning the grout lines too much. Glass is the easiest surface to maintain, I give it a good clean with water and an Enjo cloth and if it's really filthy I may spray some cleaner on it but that's about all. Clikmania you won't be disappointed with glass. Thank you so much for all your suggestions, I was pretty sure glass or anything without grout would be easier to clean, I was simply missinformed. So it's settled, a glass splashback it will be, now the colour?? ha-ha!!! Thanks dohraime! The cabinets are Laminex - the base units are SORREL with a finger pull and the tall units are FOSSIL in Riven finish so any finger prints are hardly seen as they are push catches. The stone bench top is Smart Stone - NAXOS. We had glass splash-back in our house we renovated in 2001 and loved it - fresh and extremely easy to clean! Tenants now live in that house and the glass looks as good as it did when we put it in!! The big day is tomorrow - going to the glass supplier to choose colour!! Just a word of warning! 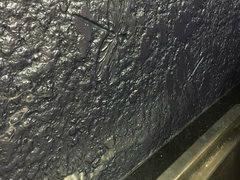 Friends had a glass splashback installed, painted creamy to match their walls - BUT - the glass had that GREEN GLASS tinge & made it look horrible. Had to have it taken out & redone with CLEAR glass. Just check before you commit if glass is your final choice. The splashback area can be such a great space to display art, design or colour for your kitchen. Create your own tiles and be unique! advised if going for grey tones to step up into opti glass that doesn't have a green tinge to it. love your kitchen. Hi Gallifrey just wondering what is the name of the wood cabinets you've used in your kitchen? 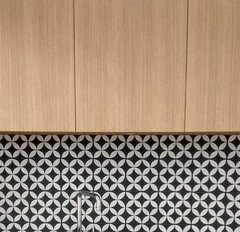 Thanks @Gallifrey, I was hoping that was it, I've fallen in love with the sample but hadnt seen pic of cupboards in that product :D They look gorgeous, and I love the tiles too, thanks! 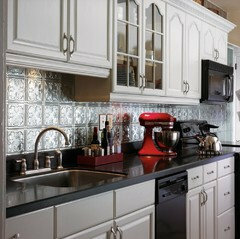 what about the new "pressed tin" look tiles that are stunning and wont date too quickly. Good luck with whatever you choose.